It’ll keep you company and help you stay in your lane. The device doesn’t work unless your smartphone is in the car. What sold me on the Garmin Speak Plus wasn’t its HD camera or Alexa skills integration. It was the short, simple beeps it played all throughout my ride. 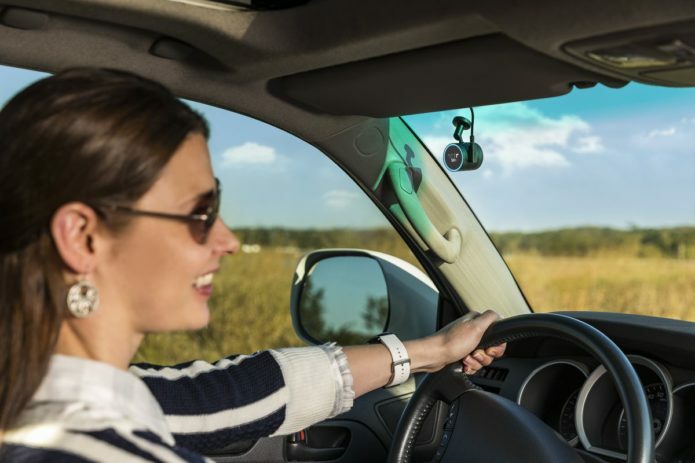 Because the Garmin Speak Plus is a dash cam, it’s constantly looking to see what’s in front of you and waiting to start recording when something happens. However, since most of the time there won’t be anything worth recording, Garmin cleverly puts its camera to use in other ways. As you drive, the Speak Plus uses its camera to help you avoid future accidents (and instances of recording). That’s where the beeps come in: a series of audible tones will alert you whenever you swerve out of your lane or get too close to the car in front of you. It might be the Speak Plus’ best feature. 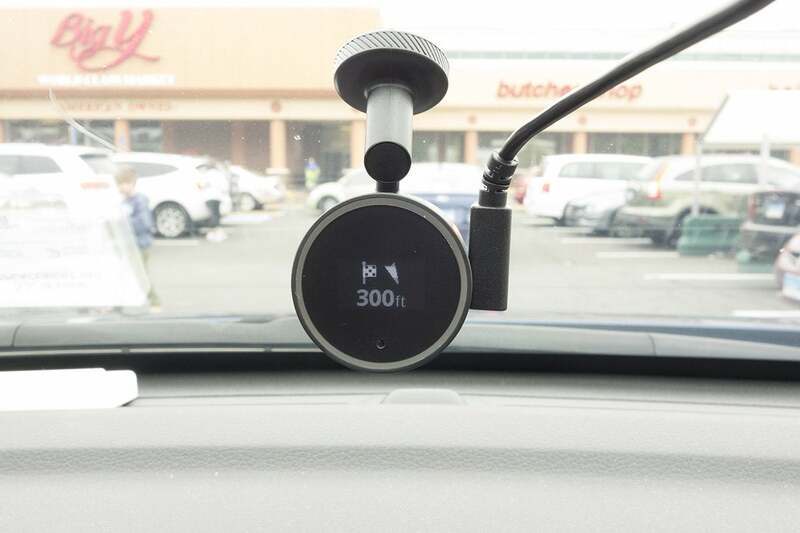 While Alexa is nice and all, it’s not all that necessary in the car, and the dash cam is more of an I-hope-I-don’t-need-it feature than one you’re going to use every day. But if you drive like me, you’ll hear a lot of beeps during your first few trips. And that’s a good thing. 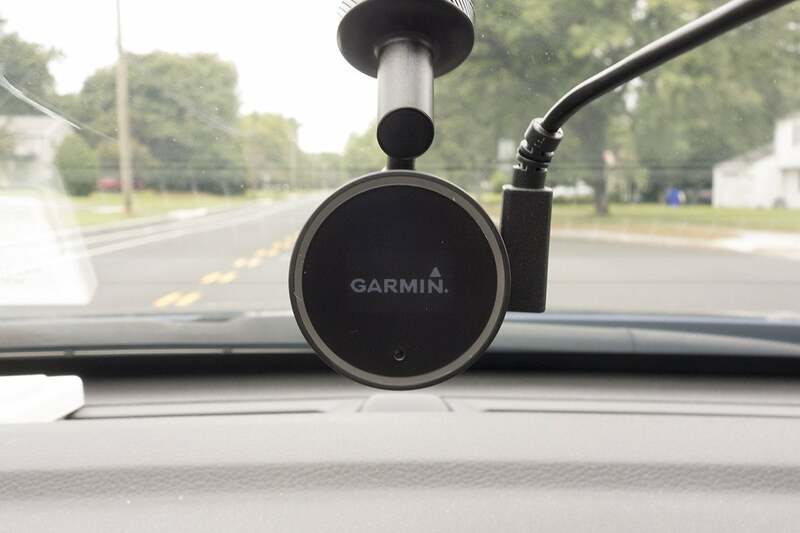 Getting the Garmin Speak Plus installed in your car will take a little patience. It doesn’t have an internal battery, so the included long, lightweight power cable is necessary for it to function. It’s designed to be routed out of sight, and Garmin recommends affixing the device just below the rearview mirror. To hide the cable, you can route it around the windshield and tuck it into the gap between the windshield and the trim. I struggled to get it to stay in the grooves of my Hyundai Sonata. Eventually I just let it dangle down the dash. Your mileage may vary depending on your car. An orange ring will let you know when there are connection issues. In an age of bigger and bigger screens, the one on the Speak Plus is decidedly tiny. The whole device is barely bigger than a pill bottle, and the display is just about an inch across and shows only rudimentary info in simple monochrome. But even though the screen pales in comparison to even that of a modern smartwatch, the Speak Plus’s overly simple GUI gets the job done. You’ll get connectivity alerts, turn-by-turn directions, and, of course, the above driving alerts. 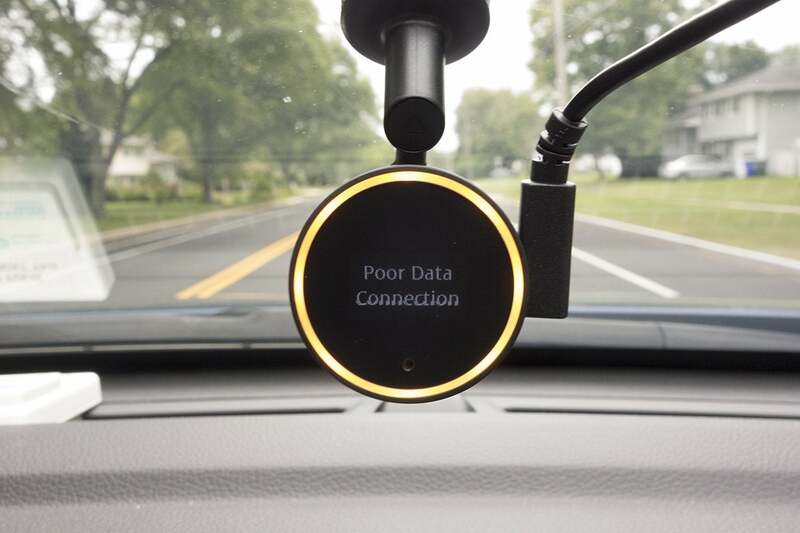 A blue ring around the edge lets you know Alexa is listening, and an orange one tells you if there is a Bluetooth or connectivity issue. As its name suggests, it’ll speak to you, too, either through the device’s own internal speaker or your car’s stereo system. I preferred the internal speaker, because the Bluetooth volume was a little too loud coming through the stereo. Setting up the speaker through the Garmin Speak app (on iOS or Android) is relatively easy, though twice I needed to quit and relaunch the app before it would let me proceed. The interface is a little outdated and not exactly what I’d call user-friendly. 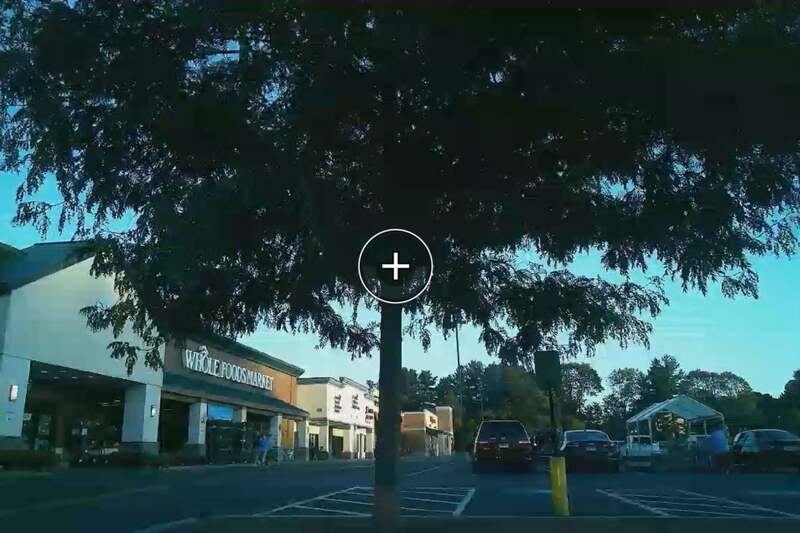 If you want to see what your camera has recorded, you’ll need to download and link the separate Garmin VIRB app. It’s a bit of a clunky solution that could use a major visual and logistical overhaul, but it generally works. The Garmin Speak app isn’t much to look at or navigate, but it includes a mess of options. But the main drawback of the app isn’t its aesthetics—it’s that it won’t work without your phone. Like at all. If you want to see your recorded video footage you’ll need to be in the car. Plus the app will need to be open to communicate with the Speak Plus (though it can be running in the background). And it works both ways: If you forget your phone, the Garmin Speak Plus is useless. When you, your phone, and the Garmin Speak Plus are all in the car together, it’s a fun device. 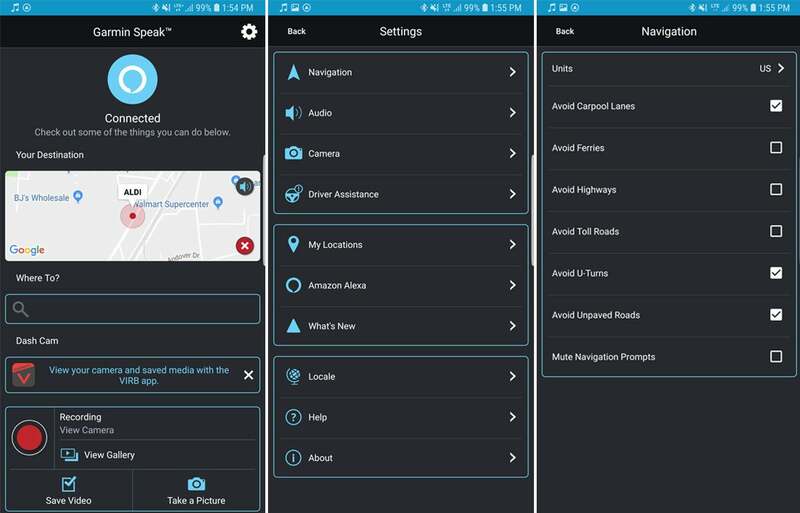 Aside from the safety prompts, you can ask it for directions, to start recording, or to play music, along with a cadre of other AI assistant features. It’s all done through Alexa, so you’ll first need to enable the Garmin skill (which you’ll be prompted to do). The screen on Garmin Speak Plus isn’t as colorful or detailed as the one on your smartphone, but it’ll tell you when you’ve arrived at your destination. Once the skill is enabled, you can talk to your Speak Plus by saying, “Alexa, ask Garmin,” and then your request. You can also ask Alexa anything you would ask your Echo to do, including controlling any smart home devices you may have. That’s handy for turning on the lights when you arrive at your house or turning down the heat if you forget. Of course, you can do the same thing by using the Alexa app or Google Assistant on your phone, but the hands-free convenience is nice. If you want directions, you can say something like, “Alexa, ask Garmin for directions to McDonalds,” and it’ll list nearby restaurants and ask which one you want. As you drive, you’ll get visual prompts on the small screen as well as audible turn-by-turn directions. It’ll also provide traffic updates and redirect you to avoid jams. The camera quality on the Garmin Speak Plus is quite good. I found the navigational cues to be slightly off from the actual turns—for example, it often said my turn was hundreds of feet away when I was upon it—but overall it was reliable for getting from point A to point B. However, most people will probably still use Google Maps or Waze, especially because your phone will be with you. 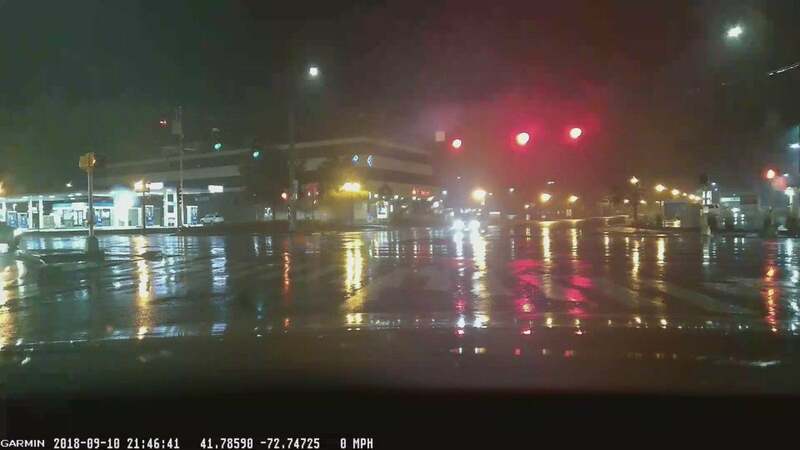 Even on rainy, dark nights, the Garmin Speak Plus cam captures high-quality images and video. The image quality is very good both day and night. Thankfully I didn’t get to test the Speak Plus’ automatic accident recording feature, though when I manually started a recording, it performed as advertised. The 8GB microSD card that’s included should be plenty of room for whatever you want to record, but if it runs out of space, it’ll loop back and overwrite the oldest recordings. If that’s not sufficient, you can upgrade to a 64GB card. Video quality is excellent, and I didn’t see any lag or stuttering in the samples I took. Should I buy a Garmin Speak Plus? There was a time when having a Garmin Speak Plus in your car would have made it Jetsons-level futuristic. 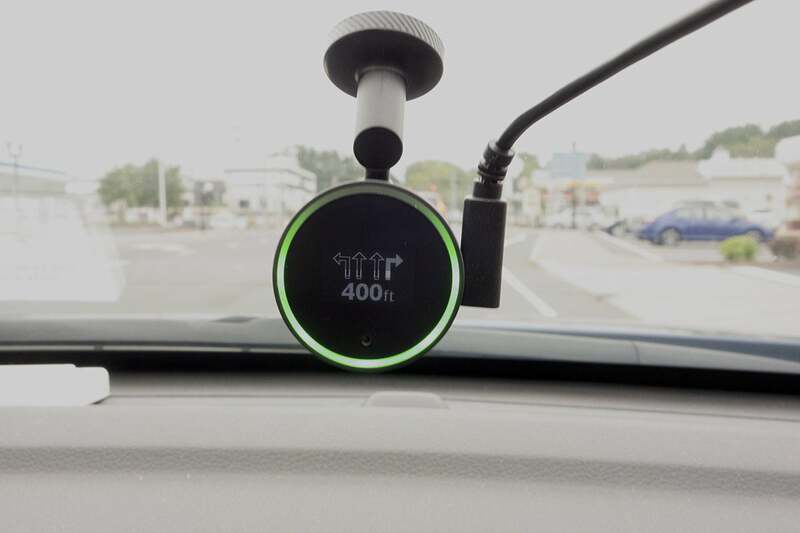 While dedicated GPS units have largely become irrelevant thanks to always-connected smartphones, the Speak Plus brings two things your iPhone or Android phone doesn’t: hands-free Amazon’s Alexa and a dash cam. That means it’ll make your car the smartest thing on four wheels this side of a Tesla. Garmin makes the most of the tiny screen on the Speak Plus. Whether that’s worth $200 is up to your particular use case, but if you want both of these things in your car, you’ll certainly be happy with the Garmin Speak Plus. The app could use some sprucing up, and the whole package is a little too dependent on in-car use, but overall the Garmin Speak Plus is as cool and futuristic as GPS devices were all those years ago. And it just might save your life, too.